Supers Vol. 1 Review – AiPT! Everyone remembers their first day at school — feeling like an outsider because you are an area where your parents cannot guide you. But, through the teaching from other adults and hopefully forging friendships with other children, it is the start of creating your own path in life. This sense of child mentality is reflected in Supers, even if it features super-powered aliens. Originating from a planet hidden somewhere in the constellation of Cassiopeia, Matt, Lily and Benji have come to Earth in an attempt to blend in and live their lives. Starting at a new school, which is hard enough already, the three orphans can’t use their powers, in fear of being discovered. But how long will this secret be kept away from the public? 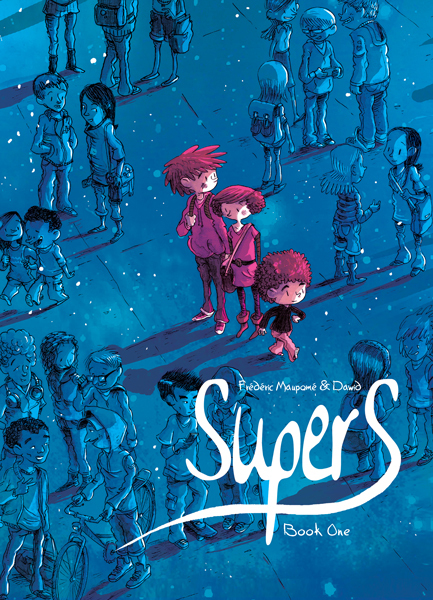 Originally published by the French publisher Editions of the Gutter in 2015 and now reissued by Top Shelf Productions for this English-language edition, Supers gives us a unique presentation of a potential superhero origin. Despite the sci-fi angle that is touched upon in a couple of pages, writer Frédéric Maupomé is more interested in the youthful hijinks of the trio trying to adapt to a new environment where they face problems that we can relate to, such as bullies, crushes and loving your annoying siblings. Despite their otherworldly origin granting them a high intellect and numerous superpowers like flight and superhuman strength, Matt, Lily and Benji are still children who have no parents to guide them and need to act on their own in order to survive, even if some of their decisions could lead to life-threatening results. As the oldest, Matt has to be in charge and understands the danger more so than his siblings, despite the fondness he has for a girl from school, which makes him the target of Frank the bully. As for Lily and Benji, who were too young to remember their time before Earth, don’t have the same discipline as Matt. Both embrace their powers more than he does, without realizing their lack of restraint. At this point in the story (which has already spawned four volumes), no conflict has been established and even when the central trio bicker at each other, they quickly forgive each other, which is always touching at the end of the day. Aiming at a younger readership, it helps that Dawid’s storybook-like artwork attracts that demographic. For a story that is predominately action-free, the artist puts a lot of attention into the detail of his large panels, where the various locations of the unnamed city are given as much character as the childishly cartoonish characters that dominate the pages. With such vibrant colors and expressive characters, there are plenty of pages without any word balloons and just the art itself can convey the heartfelt emotions for readers of any age to feel. In the tradition of first volumes that are largely setup, there are things in the story that are left open-ended for future books, but Supers benefits greatly from not only great art, but also a touching and witty exploration of three super-powered aliens who behave like your everyday children. 'Supers' benefits greatly from not only great art, but also a touching and witty exploration of three super-powered aliens who behave like your everyday children. Stunning colorized art by Dawid, which is both childlike and incredibly-detailed. Three compelling protagonists in the shape of Matt, Lily and Benji. Less about the superpowers than it is about coping with relatable problems such as bullies, crushes and coping with sibling annoyance. Not much conflict established and leaves things hanging for future installments.